A new movie titled “MIDNIGHT OIL 1984” is coming to select Australian cinemas on May 10. Take a look at the trailer for the film which features fresh and rare footage from on and off stage of the Oils in the mid 80’s. Tickets and more info available via mad.mn/midnightoil1984. For fans outside Australia, head over to the official Facebook event page Midnight Oil 1984 – The Movie and click “attending” – news about international rollout will be shared here as it is confirmed. The Great Circle 2017 has finally returned to the place where it all began for Midnight Oil – in their hometown of Sydney. Appropriately enough for a tour that included 77 incendiary shows, things ended with a bang. The final fortnight saw the band sparring with a former Australian Prime Minister, continuing their campaign against the filthy Adani coal mine and celebrating a victory for love over fear, all while battling the elements and a ‘season ending injury’. 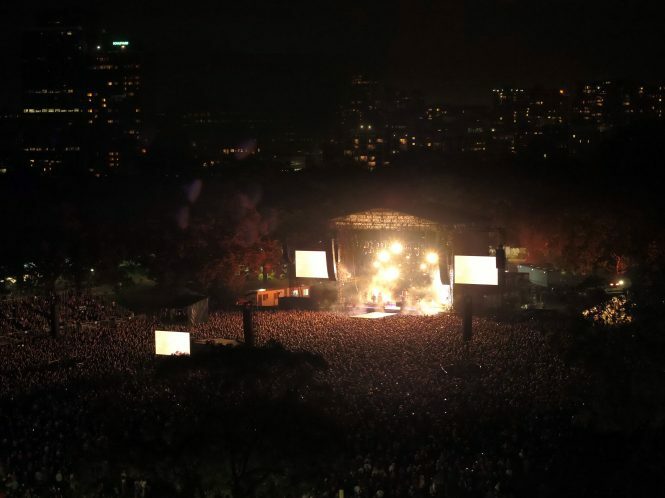 Back to back shows on unusually cold nights in Wodonga and Hanging Rock plus a rowdy Melbourne Cup Eve gig two nights later at the Sidney Myer Music Bowl reached over 50,000 of the most vocal fans seen (or heard!) anywhere on the whole tour. Unfortunately things then took a nasty turn during an encore Bowl appearance when keyboardist/guitarist Jim Moginie took a tumble right at the end of the main set. In an attempt to protect his guitar during the fall he tore his hamstring tendon completely off the bone. For nearly 24 hours there was talk of the remaining shows needing to be moved into 2018 but Jim chose to delay necessary surgery and committed to doing the next 4 gigs fully seated and in considerable pain. Thanks again Jim! All of this drama set up an epic return to Sydney on November 11 (aka Armistice Day). Former Prime Minister, Paul Keating, seized his chance to get back in the headines by calling the band “squatters” for performing two rock shows in a city park. Interestingly the classical music loving ex-PM had never complained when the same space was used over 50 times for opera and symphonies over the previous decades. The stoush was somehow appropriate given that The Domain was Australia’s hub of robust public debate for nearly a century but to rework a phrase that used to be well known in Australia, “these were the gigs that Sydney had to have”! A comparatively intimate but particularly intense Monday evening show in Wollongong and a rainy third Myer Bowl on the night that Australian Marriage Equality received a thumping endorsement then set up last Friday night’s Grand Finale back in Sydney. This second massive Domain gig was packed with the band’s friends and family. Special guests Charlie McMahon on didgeridoo for “The Dead Heart” and Yirrmal on vocals for the indigenous classic, “Treaty”, made the night even more special given that the concert happened within sight of the place where first English settlement occurred in 1788. From the stage the band could also see Sydney Harbour where they first unveiled this epic adventure aboard a boat way back in February. Since that time Midnight Oil has performed in 16 countries across 5 continents. They have worked their way though 106 different songs including 11 cover versions. Alongside all the big gigs, Midnight Oil also did their bit for various causes. For example an evening set on The Rainbow Warrior in Rio, green European festivals like Paleo and Ostrava plus Great Barrier Reef fundraisers in Cairns and Fremantle were among the main tour highlights. Constant advocacy to #StopAdani throughout the Australian leg of the tour has helped bring focus to that important issue and the band’s support will continue post-tour by way of the funds raised through the benefit gigs and special post-show poster sales. Behind the scenes more than 200 people have helped make this massive tour possible. Some have been part of the whole journey, others have only joined for a few weeks here or there but to each and every one of these individuals – from truck drivers to travel agents, from office staff to the band’s sensational road crew – the Oils say a heartfelt thanks for your tireless labour. For everyone wondering what’s next … who knows?! However as one final piece of news we can confirm rumors that the Domain shows were filmed and recorded. Some of that material may be released in some form next year as a memento for those who were there and as a ‘next best thing’ for all those who missed out. Watch this space for more details. But now the time has come; The Great Circle 2017 has officially come to a close. If you were one of the 500,000+ people who experienced this special tour then the Oils thank you one more time and hope you enjoyed this unforgettable experience as much as they did. Midnight Oil and are pleased to confirm that the scheduled performance on Saturday 11th of November at The Domain of “The Great Circle 2017” World Tour will proceed as planned despite the serious injury suffered onstage in Melbourne last night by the group’s guitarist and keyboardist Jim Moginie. MRI tests today revealed that Jim has a hamstring avulsion; a debilitating injury where the hamstring tendon is completely detached from the bone. As such he will need to remain seated throughout the show instead of standing for his guitar songs as would otherwise have been the case. The Great Circle 2017 has been one of the most successful tours in Australian music history reaching over half a million people globally. Midnight Oil has played 74 shows this year across 16 countries and 5 continents. The reviews everywhere have been extraordinary so if you have a chance to witness any of these four remaining shows don’t miss it (there are still limited tickets available to all shows!). To avoid getting ripped off ONLY buy tickets by clicking www.midnightoil.com/tour-dates and following the genuine links from there.